China is not only the world’s biggest Internet nation in terms of absolute numbers of Internet users, it is also a huge market for e-commerce. According to Nielsen there are 380 million online shoppers and online sales contribute to 11% of total retail sales. The spread of smartphones is helping this trend, and in 2015 71% of urban online shopper used their phones to shop online. But it is not only the urban middle-class who shop online, online shopping is also taking off on the countryside as more people use Internet there too. However, the rural-urban gap is still huge as only 30% of the rural population, compared to 64% of the urban population, was using the Internet in 2015. Since 2014, Alibaba, the owner of Taobao, China’s largest e-commerce site, has developed Nongcun Taobao, i.e. Village Taobao. They have developed a special app but also built service stations in villages where farmers who wish to use e-commerce platforms can get help with both buying and selling. Alibaba is planning to invest 100 billion RMB over the next three to five years to build over 100,000 village service station. The government is also helping promote both rural e-commerce and internet infrastructure on the countryside. Last year Premier Li Keqiang proposed to invest 140 billion RMB in internet infrastructure for the countryside to provide at least 50,000 villages with Internet access by 2020 with the goal that 98 percent of the rural areas would have internet access. In the No. 1 Central Document adopted in January this year, rural e-commerce is a prioritized area. Many local governments have also included e-commerce for agriculture in their local five-year plans. The National Development and Reform Commission (NDRC) recently signed a cooperation agreement with Alibaba to develop 300 trial regions and some 10 000 village service stations every year. While the rationale for Alibaba is to tap into the growing rural e-commerce market, the government sees this cooperation as a way to encourage people to go back to their hometown to start businesses and also develop and modernize agriculture. In March, Alibaba signed another agreement, this time with the Communist Youth League, to train and support 1 million college graduates to return to their villages to start e-commerce businesses. When I recently was in China I ran into one of these Nongcun Taobao service stations in a village I visited. The station had been set up last year and was run by a young man, paid by Alibaba, who thus had returned to his home village. The village, like many other villages in China today, have seen out migration of young people so that it is mostly older people and children living there today. While some people themselves were able to go online to buy things, others needed help and came to the young man for help. The service stations thus help villagers without any computer skills or internet access to shop or sell products online. An additional advantage of Nongcun Taobao is that it provides coordinate delivery to villages where delivery companies otherwise wouldn’t deliver. As the advertisement on the village wall above says, the service provides convenience and brings bountiful products at good prices to the village. While I was sitting chatting with the young man, another man came into the center to pick up a fishing rod that he had ordered. Among the other deliveries that day was a child’s bicycle and an ice-cream machine. The rapid development of e-commerce and Nongcun Taobao, and the close cooperation between a private company and the Chinese state, shows the great importance put on developing and using the internet for business and economic growth. While the space for talking politics on the Internet is strictly controlled and shrinking, shopping is a safe haven and actively promoted by the Chinese state leading China to become the world’s top one e-commerce country. 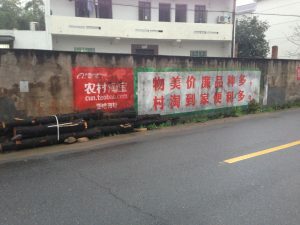 This entry was posted in Uncategorized and tagged Alibaba, censorship, countryside, e-commerce, Taobao. Bookmark the permalink. Rasmus Nordstrom on Fighting against Rumors in the Information age? Karl on Fighting against Rumors in the Information age?